Boat Seem Underpowered? Engine Not Revving up? Increased Engine RPM - More horsepower available! Increased blade tip to hull clearance. Minimal increase in drag as compared to a "standard" 2 blade. Cast from C87600 Silicon Bronze. EFFECTIVE JAN 10, 2017, THE PROPELLER PRICE WILL INCREASE TO $360. WE APOLOGIZE FOR THIS INCREASE BUT THE INCREASED COST OF SILICON BRONZE LEADS TO THIS INCREASE TO SIMPLY COVER OUR INCREASED COSTS. As part of our ongoing program of Continuous Improvement, we have refined the geometry of the Indigo Atomic 4 propeller to yield a propeller that is even quieter and smoother than the original model with slightly higher Wide Open Throttle (WOT) RPM to boot. 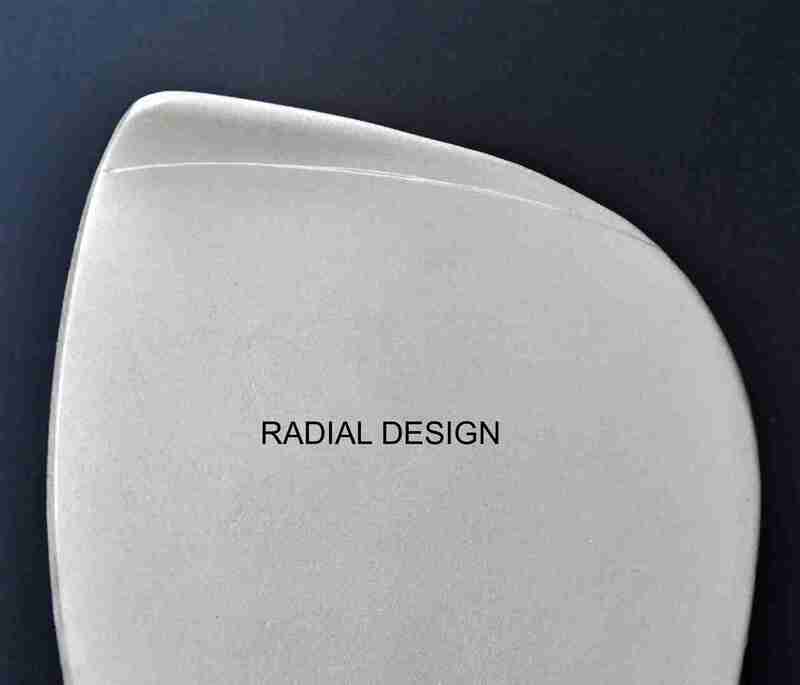 The "Radial Winglet" name refers to the change that has been made to the geometry of the winglet. The fillet that defines the transition from the blade face to the winglet in now on a constant radius. This moves the suction side of the winglet (forward side) to a location that limits the impact of tip vortex cavitation on that side of the winglet thus reducing noise in the normal cruising RPM range. Shown here are images of the old and new blades to give you an idea of the subtle differences. The "scratch" on each blade near the winglet is a scribe mark that was made at a constant radius about the center of the propeller bore. As you can see on the "Original Design", the winglet sort of flared out as you traveled from the leading edge (right side) to the trailing edge (left side). In the "Radial Design", the flare is gone and the fillet radius between the blade and the winglet is on a constant radius from the leading edge to the trailing edge. Admittedly, this does not really look like any big deal. However, it turns out to be rather significant from a torque and noise standpoint. By "rolling" the trailing edge portion of the winglet toward the propeller centerline, we were able to remove about 3/16" of winglet (at the greatest propeller radius) to obtain the configuration shown at the right. This reduction in blade area at the extreme radius plus the radial progression of the winglet fillet radius yielded a WOT increase of nearly 300 RPM in initial testing. This increase of RPM was accompanied by a very slight reduction in thrust so a small change in pitch has also been made. 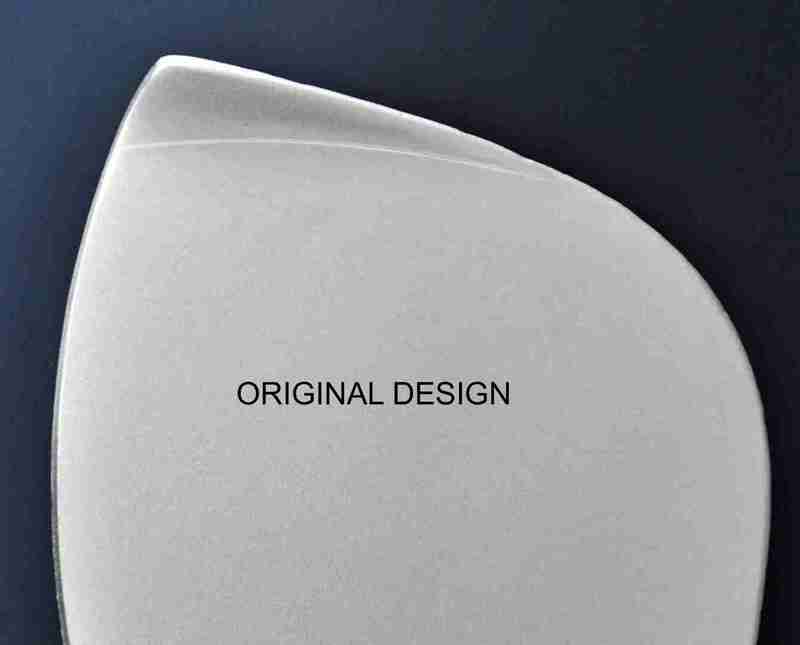 Aside from this subtle change in geometry, the Indigo propeller remains the only propeller designed from the ground up to improve performance of the Direct Drive Atomic 4 powered yacht. The design of this propeller has evolved from numerous tests with a variety of 2 and 3 blade designs, all with the Direct Drive Atomic 4 as the engine of choice. Note: Some V-Drive Atomic 4 models are direct drive in that they have a 1:1 reduction. Check name plate on V-drive for ratio. Engines with a reduction gear (not Direct Drive) are unique in that the propeller shaft coupling has four (4) bolts where as the Direct Drive coupling has only three (3) bolts. The vast majority of Direct Drive Atomic 4 yachts were originally equipped with a 2 blade, 12" diameter by about 9" pitch propeller. This application allows the vessel to achieve a respectable cruise speed in calm waters at about 1400 RPM. However, wide open throttle is only about 1700 RPM which leaves very little reserve for foul weather or bottom fouling. Furthermore, at 1400 RPM, the engine is working very hard (near maximum cylinder pressure) which leads to high loads on rings, pistons, and bearings. Increase cruise RPM to about 1900 with wide open throttle around 2400 RPM. Reduce loading on pistons, rings, and bearings by increasing RPM for a given HP. Increased alternator output by increasing cruise RPM. Increase oil flow and thus pressure by increasing cruise RPM. Increase coolant flow by increasing cruise RPM. Increasing RPM can be accomplished by simply reducing pitch on an existing 2 blade propeller but not without consequences. Most installations have less than the recommended 15% tip clearance between propeller and hull and at higher RPM, considerable noise is generated by vortices coming off the tips of the blades. Our propeller meets all design objectives. It is a 3 blade design at 10" diameter and 7.4" pitch . The 3 blade concept yields much less propeller induced vibration yet total blade area is only about 8.0% greater that the original 2 blade design and 12% less than a CDI or Perfect Pitch propeller. The propeller is investment cast of C87600 Silicon Bronze for strength, durability, and accuracy of pitch and blade geometry. The smaller diameter and blade winglets virtually eliminate the unacceptable noise associated with tip vortices generated at the higher RPM. The smaller diameter and 3 blade design also leads to a significant reduction in "prop walk" when operating in the astern direction. Propellers are available in right hand rotation only for 3/4", 7/8" and 1" shafts. Instructions are included for removing your existing propeller and installing the new propeller on your existing shaft. HOW DO I KNOW IF MY ATOMIC 4 IS DIRECT DRIVE ? The easiest way to tell is to look at the engine coupling between the engine and the propeller shaft. If there are three (3) bolts holding the two coupling halves together, then you have a direct drive Atomic 4. The engines with a reduction gear have a coupling with four bolts. Note: Some V-Drive Atomic 4 models are direct drive in that they have a 1:1 reduction. With the V-Drive, however, do not rely on the number of bolts to determine direct drive. Check the name plate on V-drive for ratio or rotate the engine in forward and check the ratio.